Business is moving faster than ever, and the biggest accelerator might just be software. Software applications are what allow for optimized virtual workflows and automation of tasks across users and across the cloud. It’s not just for technical companies and industries any more. Every year, more companies are taking advantage of third-party software applications, and this Forbes article shows that soon 80% of IT budgets will be going towards cloud apps and solutions. The use of software applications is spreading across various sectors of business. Let’s explore four of them. Marketers use software to track lead flow and metrics. Solutions such as Marketo, Optimizely, and Kapost help marketers be more efficient, gain visibility on what programs work and don’t work, and reduce wasted marketing spend. Finance and accounting teams run entire accounting infrastructures on software applications for things like “accounts payable” and “accounts receivable books.” Companies also often develop their ownbilling software to meet unique needs of each organization. Sales teams manage the entire sales cycle in software with customer relationship management software. Sales productivity software such as Yesware has increased the speed in which salespeople work and report their progress. IT teams develop and leverage numerous software applications like programs to help manage their internal IT infrastructure, or provide core services to their employees. There are a wide range of applications that IT teams purchase from network monitoring to security to directory services. “Software enables organizations to move at a breakneck pace. It automates manual tasks. It makes people more efficient and purposeful. 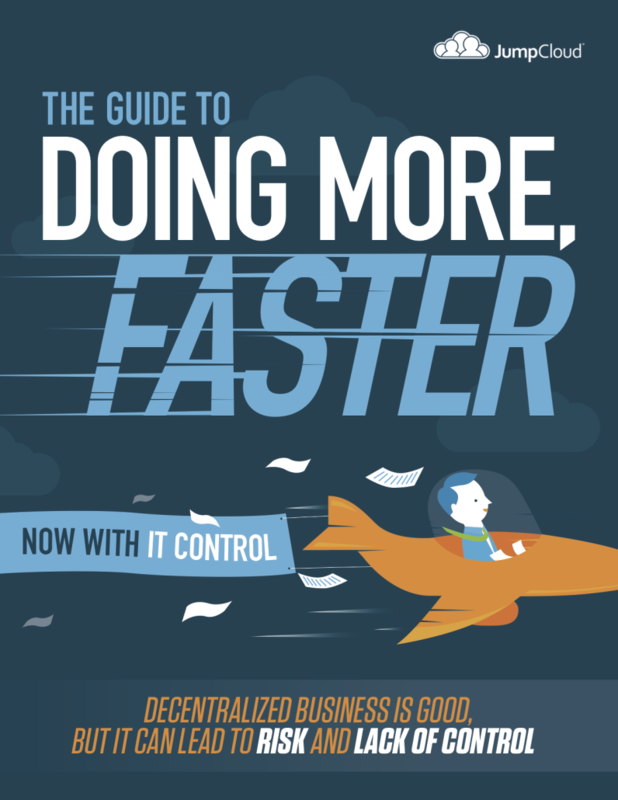 It allows teams to do what they couldn’t do before,” writes JumpCloud CEO Rajat Bhargava in The Guide to Doing More Faster. Software can be your competitive advantage. But it can also be the bane of your existence. The rapid adoption of new software applications is a surefire way to waste time and money – and to undermine your network security. In the ever-evolving world of business software, administrators need a system of best practices to ensure the effective adoption of apps. That’s exactly what Bhargava lays out for us in his chapter in our free guide. Take a look. If you’d like to learn more about bolstering your infrastructure security with our cloud based Identity Management solution, drop us a note. You can also start testing Directory-as-a-Service by signing up for a free account. Your first ten users are free forever.